Some things are easy to take for granted, like Christmas. People get caught up in the hoopla and forget that not everyone in the world celebrates Christmas, like bartenders, emergency room physicians, and Jews. As a Jew, I’ve always felt a little left out. It was especially hard as a kid when all the other children were trimming trees, caroling, and eating Christmas cookies, while the closest I got was watching a Charlie Brown Christmas on TV. Sure, I had Hanukkah, but let’s face it; Judah Maccabee may have won the battle for freedom but he’d have been more of a hero to me if he’d dropped down my chimney carrying a sack full of presents. And a menorah may be an important symbol of independence, but it couldn’t hold a candle to the dazzling tinseled fir tree in my friend Jenny’s living room. While I appreciated the eight nights of Hanukkah with its candle lighting, chocolate coins and traditional foods, it lacked the luster of Christmas. I yearned for the universally shared Christmas spirit. The hardest years were those in which Hanukkah didn’t overlap Christmas, when I couldn’t use delicious potato pancakes with sour cream and applesauce to buffer my Christmas sorrows. But the worst was the year Judy De Marco handed Christmas cards to the whole 4th grade class, except for me. Although I had grown up in a town with minimal ethnic diversity and was the only Jew in my class, this was the first time in my life I had ever felt excluded. I remember calling my mom from the school office, crying about how hard it was to be a minority. Maybe I wouldn’t have taken it so hard if I’d had a stronger connection with my Jewish community. But only a few Jews lived in my hometown and I was related to most of them. I promised myself that one day, when I got married and had kids, I would settle down in a more Jewish neighborhood. Thankfully, despite the fact that I’ve raised my kids in the same kind of homogenous community I grew up in, their active involvement in synagogue life and Jewish summer camp has helped them develop a close connection to our Jewish community. They also enjoy an active Jewish home life. My husband, of Jewish decent, was raised Christian and celebrated the kind of Norman Rockwell Christmases I yearned for as a child. When we married, he returned to his Jewish roots and embraced the Jewish holidays. Chris transfers his enthusiasm for Christmas to Hanukkah and brings a lively and unique spirit to our celebrations. He tunes in Hanukkah music on satellite radio, decorates the house to the hilt with stars and dreidels, and piles presents under the menorah like a Jewish Santa. Gratefully, my kids don’t feel left out of Christmas. I’ve never received a teary phone call from the school office, a request to place a Christmas tree in our living room, or an appeal to go caroling. Chris and I would love to take the credit for our children’s sense of fulfillment. But in fact, it’s probably more the doings of my in-laws than anything. Since our kids were born, they’ve invited us to their home each December to share a special holiday tradition with them—Christmas. A heartfelt, honest appraisal of your thoughts and feelings at this time of year. Beautifully written. Thanks Ronnie. It’s taken me years to understand them! As you know from my recent post, I always lusted after Christmas when I was growing up. When I married a non-Jew, it was my permission to throw myself into the holiday, albeit only at his parents’ house. Each year, we drove up to Philly and spent the holiday there. My kids always thought Santa didn’t know how to get to our house. Then, when my MIL got Alzheimers and could no longer have Christmas, I had to make that Big Decision. It was really tough, more because I felt like I would be letting my parents down (even though my mom had died many years before). But we got the tree, and we decorated it with a mixture of Christmas and Chanukah. The kids got eight small Chanukah presents and Christmas presents under the tree. I don’t think they were psychologically damaged in any way. tell people I’ll celebrate anything, as long as it involves gifts and/or food. Thanks for the thoughtful comment. I had to chuckle at the bit about the kids believing Santa didn’t know how to get to their house. Sooner or later (with the invention of GPS) they would have been onto Santa anyway! I think your experience is relatable to any Jewish kid growing up in a non-Jewish area. We always had the dark house on the street and I was always asked to be the designated Jew to light the symbolic classroom menorah and do an oral report about Hanukkah. I don’t think it is the religious signficance I yearn for, but Christmas seems like more fun with the music and glitz. It’s hard to be the only one not playing in the reindeer games. Loved the line about the menorah not holding a candle to a Christmas tree. I’ve always been a sucker for a good pun. And I too was the designated Jew! Great message here for every day…not just those designated as Holi-days! I know what you mean about being a minority. I’m Cajun and the real bad part about that is even down here there aren’t enough of us to be a minority. What’s double crappy for me is I have a Jewish surname and I grew up with everybody thinking I was Jewish – even in Catholic school. So I got the Jewish treatment at school by the kids. My mom married my dad who was born and raised in New Jersey. He met my mom in a bar in New Orleans – no more details. When I was a baby I lived in a predominately Jewish neighborhood. My mom actually got money from the Jewish ladies in the apartment building to hold me. I know, Jewish women actually paid money to hold me. I was a gigolo from birth. My mom liked the Jewish ladies so much, for the rest of her life she said she missed her calling and got off the wrong bus stop from heaven and should have been a New York Jew. P.S. She is also the only person I know thrown out of Catholic service by the priest for cutting up in church. When I got home one day as a teenager I saw this thing nailed to the door. Mom, whuddup with that thing on the door? “That’s a mezuzah honey.” A whatah? Is that French? (My mom spoke French until she was in the first grade. Where she grew up in Louisiana French was the predominate language.) “No honey, that’s Jewish.” Great, does dad know that? Yep, he nailed it there. Then one day my dad was doing the family tree and learned his Great Grandfather was named Samuel and his father was named Isaac. My dad was all, “No, no, they were Baptist.” Okay, whatever! So that is how I became a Judeo-Christian, Cajun, Gigolo, Jew. I know, huh? And you wonder, how in the world I got so goofy? Don’t you feel sorry for me? But, as you know, I can’t be Jewish unless my mother is. P.S. Every word of this is true. I am ROFLMAO!!! Oy Vey Y’all. Too funny!!! As a Tibetan Terrier owner, I must object! And I thought our dogs were friends!!?!?!?! You know I love Bailey! I would have said Lab, but Tibetan Terrier offered both better comedic timing and illiteration! When I was little I wanted to be Jewish so badly. For Christmas I asked for a Star of David necklace I saw in an Avon catalog. I wanted to renounce my Catholicism and become full blown Jewish. Who wants one day of stinky Christmas when you can have eight days of celebration? I saw Catholics as uptight and unoriginal, and Jewish people as party animals! Now that I’m older I find it amusing because I always hear these stories of the grass being greener on the other side. That’s right, it is greener on this side–Greenberg, Greenstein, Greenblatt . . .
My boyfriend is also a ‘Hillbilly Jew ” –as I call him– from Knoxville Tenn! The only Jew in his town ( He got beat up alot too which is sad) When he was a kid he always felt bad because “Hanukkah Harry” brought him boring stuff like socks and pajamas..while all the other kids had Santa who brought shiny new bikes, and dolls, etc. Oy… no wonder we are all a little neurotic! Lisa- this story brings back memories of leaving out cookies for Santa and how, one night when I was about 8 years old, I discovered daddy eating Santa’s cookies at 3:00 in the morning. Daddy was Jewish Santa – who knew. Being Jews ourselves, my parents didn’t want us kids feeling left out on Christmas day, so we would always wake up and discover a slew of presents on the living room floor every December 25th. Those were great times. Thanks for bringing back great memories with your great story. I understand where you are coming from. I think your husband has it right. It’s about the enthusiasm in which you embrace your beliefs. The holiday can also be different for Christians who aren’t regular church goers or Catholic. As a kid, I used to be jealous of my Catholic neighbors because St. Nicholas came and their holiday was filled with so much ritual. We also had good friends who are Jewish. They would share some of their traditions with us. Latkes and Matzo Balls – forget about it! Love them. Mazel Tov from The Laughing Shikse! You said it well–“embrace your beliefs.” That’s the crux of it. I found your point interesting about Christians being envious of others more devout. That never crossed my mind. Glad to hear you had good friends to share holiday traditions with. Happy Holidays! So I’ve nominated you for the Versatile Blogger award. Again, I guess, as I see you have one on your site, but you see, the one I gave you is from a post that has projectile vomiting illustrated, so it’s *special*. Thank you for the Versatile Blogger award. It means a lot coming from someone as funny and clever as you. I shall post it on the doorposts of my house and on my gates. Wait. Scratch that. I’m thinking of a mezuzah. I shall post the award on my blog. There is so much of the Jewish heritage and beliefs that is part of the Christian holidays. 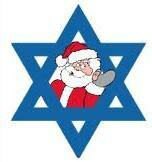 Passover, the last supper, Crhistmas…and the newborn kind of the jews. So much: they are enmeshed, part of each other. I don’t separate…and my children know the roots of so many things that we celebrate, are Jewish in origin. It’s part of something so large…we just can’t set it one side over another. This post here, reminds me of our household. Yes, there is plenty of overlap in Judaism and Christianity–and in the Islamic religion too. I’m glad my post resignated with you–thanks for commenting. I love this post! Sorry it took so long to comment! Mazel! New Passover youtube music video. Very insperational – must watch!